In honor of Friday the 13th, this morning The Atlantic took a look at the number 13—and namely how obsessively superstitious some individuals can be when it comes certain digits and our inclination to apply a deeper meaning to them. 18, for instance, is chai in Hebrew, which means life; while number 2 represents balance and cooperation in Chinese; and of course we’re all familiar with the divine and oh-so-lucky number 7. But then there’s 13, a number generally looked upon as especially sinister, particularly in Western culture. In fact, 13 is so suspect that there’s even a scientific name for the fear of the number: triskadekaphobia (a fear of Friday the 13th the date is called paraskevidekatriaphobia, by the way). But here’s the funnest bit in the piece that really grabbed our attention: Taking a closer look at New York’s residential buildings with the help of CityRealty, they found that of the 629 buildings with 13 or more floors, only 55 had labeled the 13th floor as the 13th floor—that’s only 9 percent of the total. Common placeholders they found were 14, 12B, 14A, M (the 13th letter in the alphabet) or simply “Penthouse” if the top unit sat on the 13th floor. 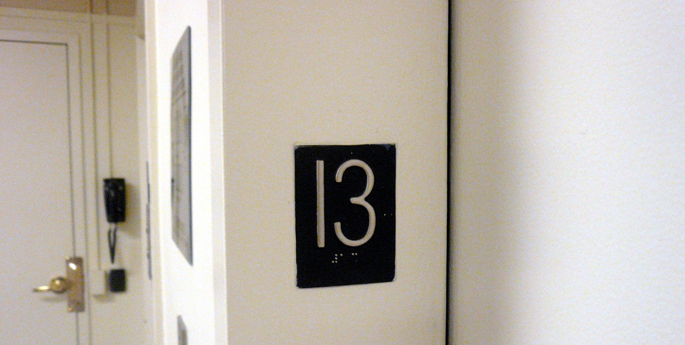 So is the number 13 really enough to scare someone away from renting or buying an apartment? Apparently not. Like graveyards (see: Do Cemeteries Affect Real Estate Prices in New York? ), brokers report that in a tight market like New York’s, there’s no room to over-think this stuff. CityRealty‘s Director of Research and Communications Gabby Warshawer adds that it’s mostly a preventative measure. “It’s not an issue that the real estate community is very concerned with,” she told the magazine. “But from the developers’ perspective, even if there’s a .01 percent chance it’ll affect prices, why take a risk at all?” She also says it gives a developer the chance to fudge an extra floor into the total count—a little white lie that adds the illusion of height in a city where everyone is fixated on the supertall building boom. You can read more about others’ number-centric superstitions over at The Atlantic.